Nearly six months ago, Team Alex set out to raise $7500 by September 5th. It seemed like a huge goal, but we went for it with our typical determination and gusto. We did countless $10 Tuesdays. We played kickball. We smashed pies in friends’ faces. Little by little, with a ton of help from amazing family and friends, we added to our fundraising total. With about 24 hours left until the fundraising deadline, we have exceeded our $7500 goal. I can’t believe it. You still have time to register and/or donate, though! Please check out our fundraising page here to join the fun. Announcing: Team Alex’s City BBQ Fundraiser! It’s time to focus on the next fundraiser for Team Alex! 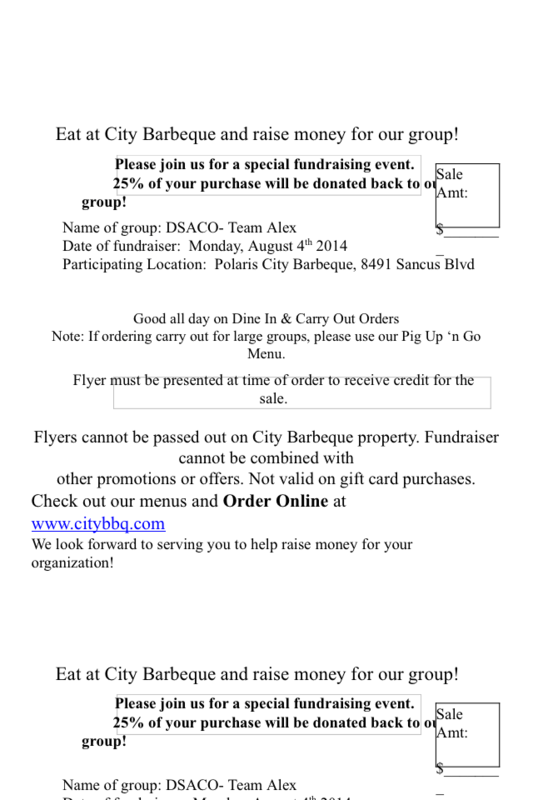 On Monday, 8/4, we are partnering with City BBQ to raise money for Team Alex; we will get 25% of our purchases! The 2014 Columbus Buddy Walk will be here before we know it! Thanks so much for your continued support of Team Alex! With less than a week left in our I Heart Garments fundraising campaign, it’s time to kick our efforts into high gear! If you don’t order your tshirt/hoodie by 7/21, you will not be the proud owner of this limited edition item. That would be sad, but even worse, you won’t get to show your support for the awesome idea my (almost) eight year old daughter wants to share with the world. 10. This is an awesome shirt. It’s super soft, way comfy, and ultra cool. 8. Inclusion goes well beyond the special needs community. It’s important to teach our children, as well as our peers, that everyone should be loved and accepted for who they are. 7. The design! The real hand prints illustrate real people joining hands to represent inclusion, while the thumbs come together to form a heart to represent Addie’s vision of sharing a message of inclusion via her foundation, Giving Hearts. 6. In a world which values potato salad fundraisers, this is a genuine fundraising campaign which is also trying to spread kindness. #InclusionMatters really should get more support than a picnic side dish, wouldn’t you agree? 5. How often do your clothes make an awesome statement but also support a fantastic organization? 3. These super cute kids are way excited to share this campaign with you. Don’t disappoint them. Share, share, share! Share this blog post, post my Facebook updates on your own page, retweet my reminders. 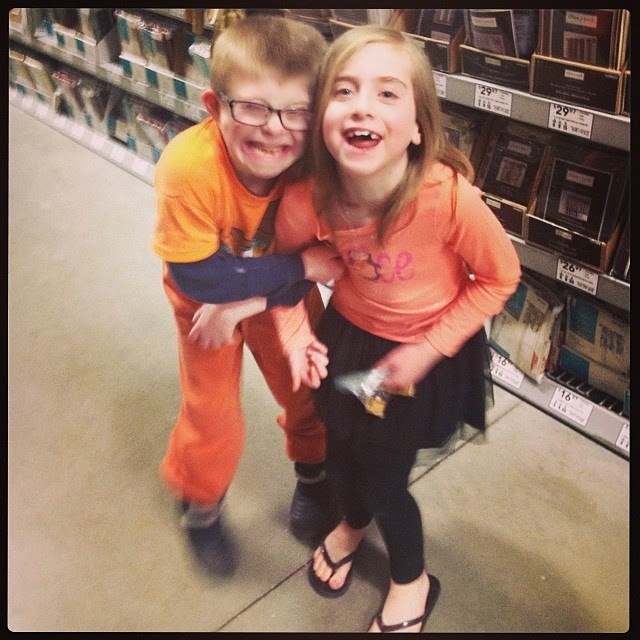 Alex and Addie crack each other up! 2. WE ONLY HAVE UNTIL MONDAY, 7/21, TO SELL THESE AMAZING SHIRTS AND SHARE THIS VERY IMPORTANT MESSAGE!! Buy the shirt. Share our message. #InclusionMatters. It really, truly does.